November has been wonderful for many reasons; here is my last-day-of-the-month attempt to document some goodies! 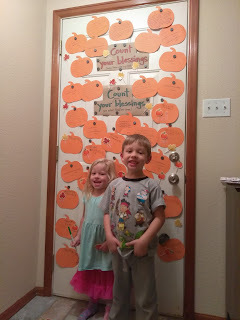 We continued our Thanksgiving month tradition of posting "I'm grateful for..." thoughts on the back side of our front door. Our third annual attempt was very successful. Both Ezra and Maren were studious and thoughtful for a full twenty minutes. 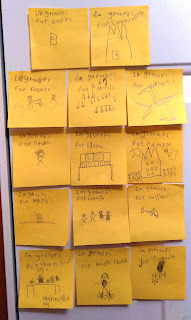 Ezra didn't want any help with ideas or spelling, and even illustrated each of his little sticky notes. Maren needed help with ideas; she came to me, pencil and paper in hand asking, "Mom, what am I grateful for?" I rattled off ideas, and when I mentioned one she liked, she would smile and go back to her little table and draw the concept. In the end, we had quite a collection of creative "I'm grateful for" ideas. 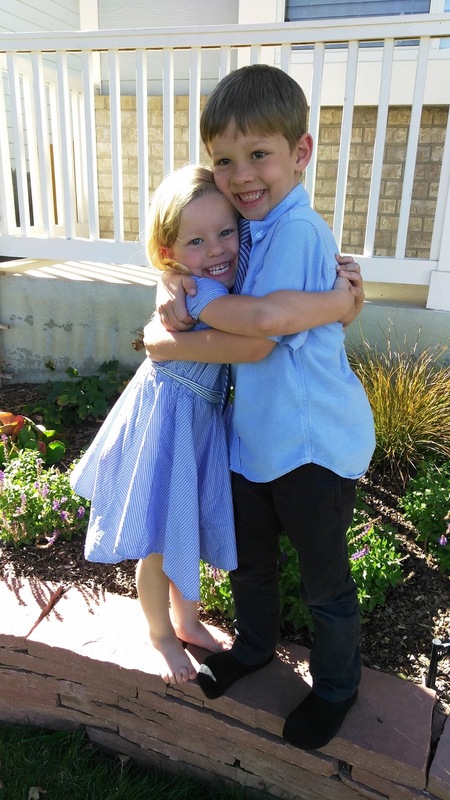 "I'm grateful for General Conference." "I'm grateful for the temple." 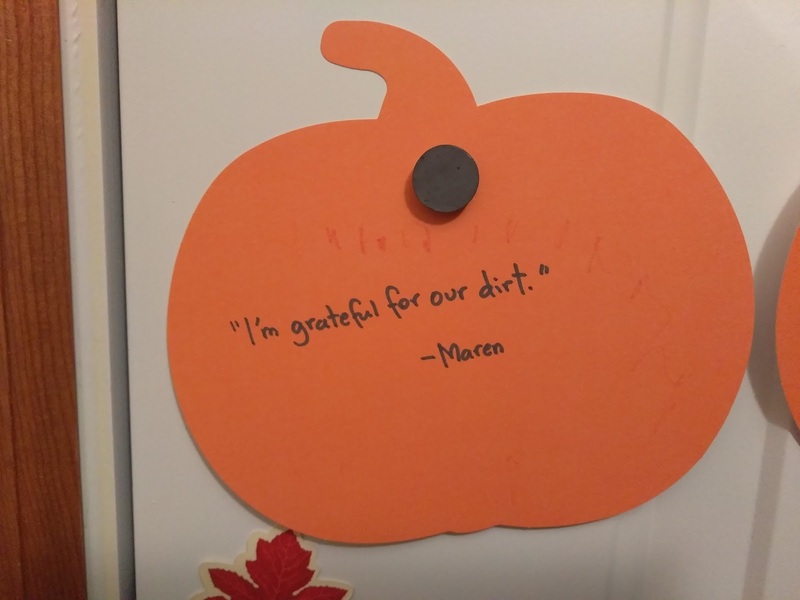 "I'm grateful for Maren friend." 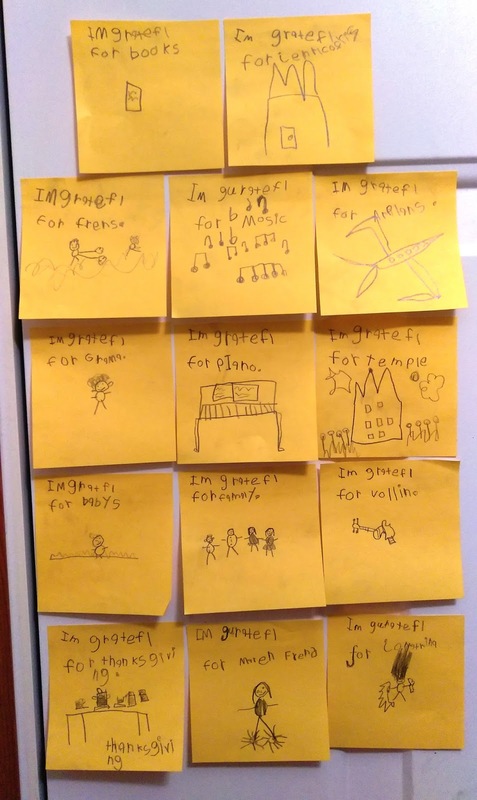 A rather impressive list for a six-year old! Maren illustrated her ideas with a style all her own. Her people have big sunny-side-up egg eyes, many eyelashes, active arms, and poofy hair. I love it! "I'm grateful for flower gardens." 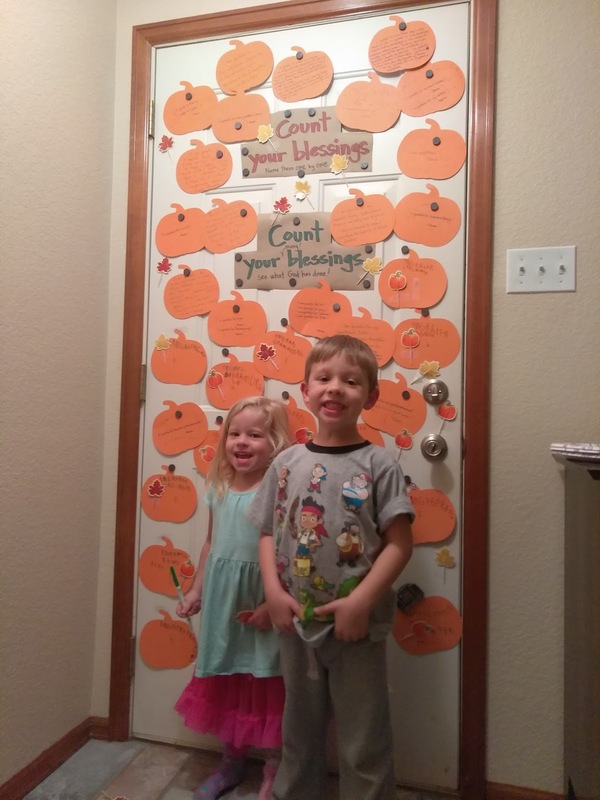 "I'm grateful for my house." "I'm grateful for legs for walking." "I'm grateful for opening Christmas presents." We made turkeys in disguise--just for fun! The kids and I love an excuse for an art project. We created a sports fan turkey, two diseased turkeys (note the spots--don't eat me! 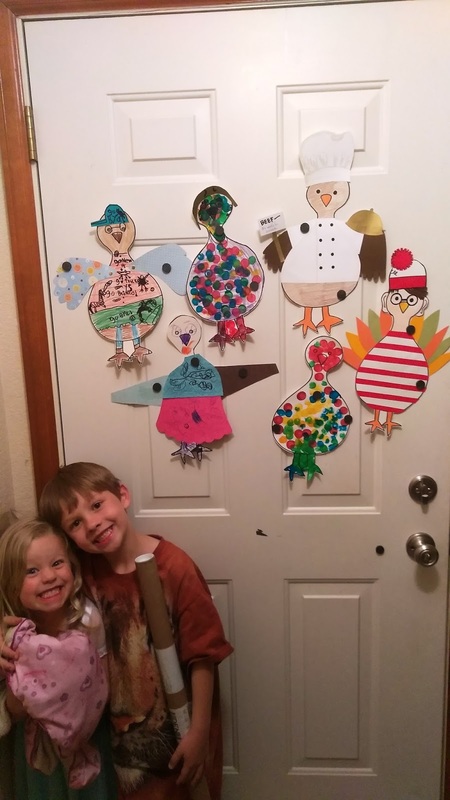 ), a chef turkey (beef is what's for dinner, of course), a ballerina turkey, and Where's Waldo turkey. 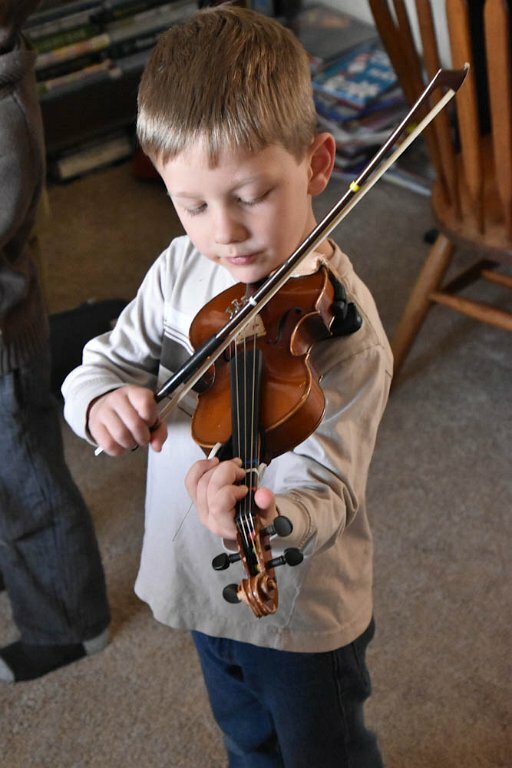 Ezra had his very first violin recital organized by Roslyn at her chapel on Sunday November 12. Ezra played "Go Tell Aunt Rhody," and made a number of mistakes, but was brave and calm, and finished the song! I was so proud of his composure and willingness to participate, his poise, and his effort. As he walked back to his chair, he was beaming from ear to ear. "I did it Mom!" he announced in an excited whisper. Hooray for Ezra! 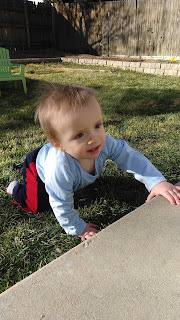 As of yesterday, 29 November, Jonathan can crawl! He has been rocking on all fours, backing himself into corners, rolling over, coming out of sit, and reaching for things all month, and he finally figured out crawling too! He is a little clumsy, and slow, but definitely on the move. We certainly love our happy Jona-boy. Also, mid-month, I started introducing some bites of people food, and our meal time experience has completely transformed into a very positive experience. He was not much a fan of baby food, and would either refuse to eat, or scream when offered baby food. Now, he can't get enough of little bites of almond butter toast, blueberries, cheese crumbs, ham pieces, avocado, pancakes, grapes, etc. And, best of all, we spent five truly wonderful days of our Thanksgiving break in Utah with my extended family. I was in college the last time I attended such a gathering for Thanksgiving. 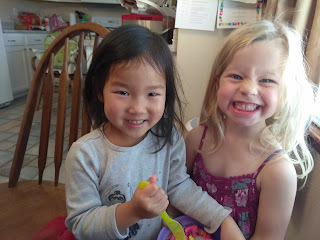 I was especially grateful that my kids got loved on, spoiled, and entertained by many adoring aunts and uncles, and had quality play time with darling cousins. There were a number of cousin free-play opportunities, including getting to play with Grandpa's electric train set and forest animal set-up. Movie night with popcorn and blankets in Grandma and Grandpa's theater room was a big highlight. 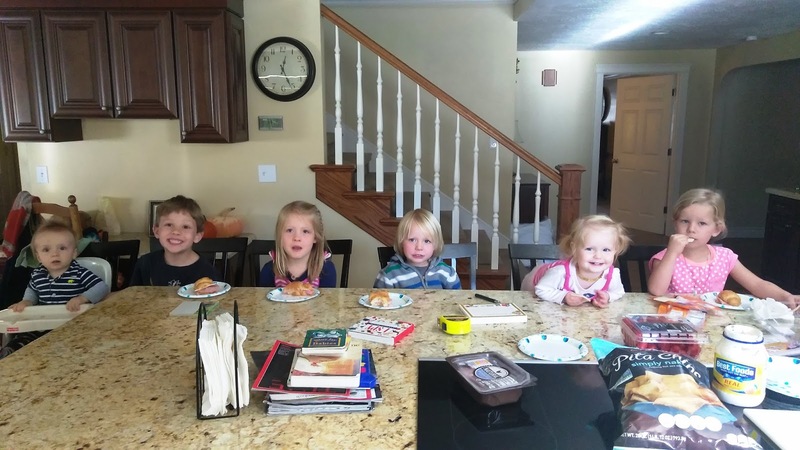 Ezra and Maren loved rolling dough for homemade crescent rolls on Thanksgiving. Molly and John announced the upcoming arrival of their "Baby Jolly" due in June 2018! We also enjoyed bowling, a Trax train ride to downtown Salt Lake City, and opening night of the Lights at Temple Square. We are so grateful for family! 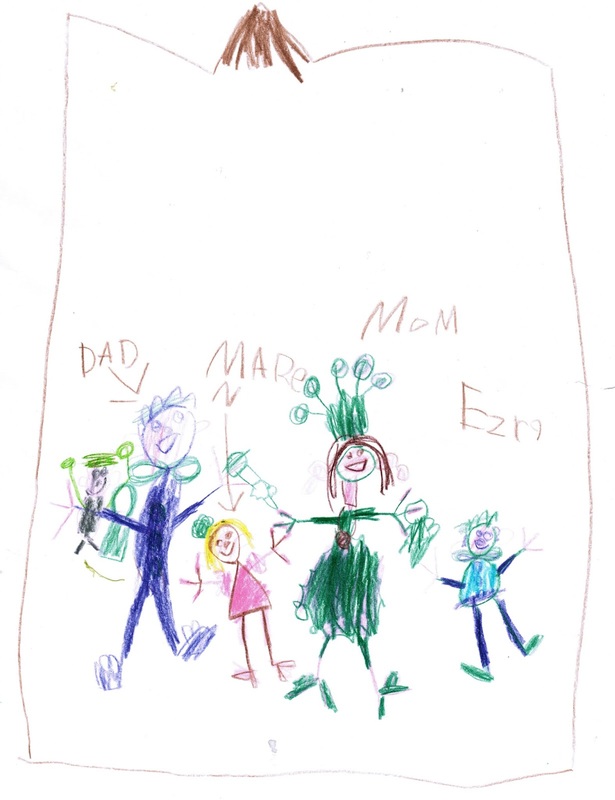 Tonight we had a little free time after dinner and Ezra created this darling family portrait. We are at church--notice the brown steeple on top. Dad is sporting a fantastically huge bow tie, Maren is pretty in all pink, and I have the coolest head adornment and "tip-toe" shoes you ever did see. Dad is also carrying the keys, the church bag, and Jonathan, which is what usually happens; Ezra is so aware of details! Ezra has been invited to a Friday art club that starts tomorrow. His kindergarten teacher will keep interested students for one extra hour after the normal dismissal time for stories, music, and art; an hour of fostering and encouraging creativity! I am so thrilled that she is committed to that kind of learning. Ezra loves art, loves books, and has a great ear for good music, so I am excited to see what comes from his special class. Please forgive the blog writing drop-off. Ezra's seven-day hospital adventure over two different weekends in June and July upended our life for a few months. But, with a clear diagnosis, and a wonderful treatment plan, we started to get back to normal life, and then school started. Now, almost two months into the school year, I am still feeling upended. The lazy toddler/early preschool days--when every day felt like Saturday, expectations were low, and the schedule was loose--are gone. Ezra goes to school five days a week in the morning, and Maren goes to school four days a week in the afternoon. 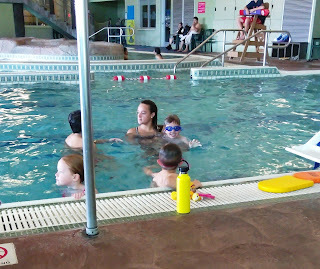 Add on time for swim, dance, and music lessons, and we are definitely more structured. 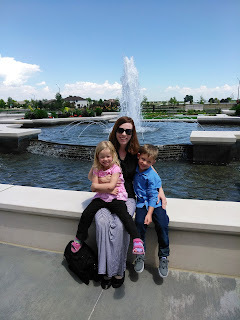 Structure isn't bad, just different, and this Mommy is slow to adjust, not very organized or efficient, and still trying to find a good balance for other important family needs. 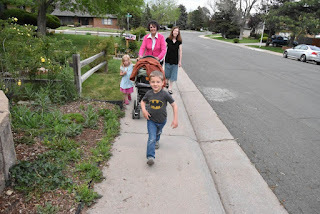 Also, for the first time in their lives, the children have alarm clocks, and on weekdays we have to be walking out the door dressed and ready at 7:15, which has been a huge game changer. 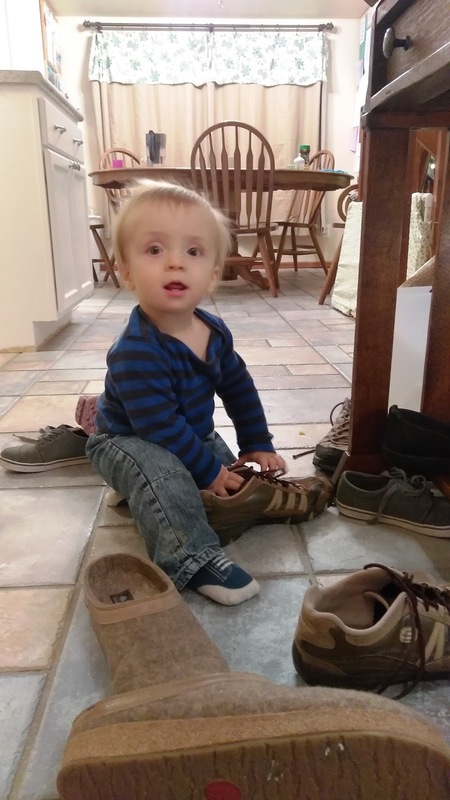 Earlier this year, Jonathan was sleeping for most of the day and night, and had low needs. 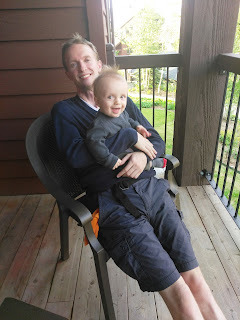 Now, as an eight-month old he is more active, and attention-seeking, eating baby food, starting to discover his mobility, teething, and very vocal. So, I am making adjustments there too! Life is good! But, all the change equates to the blog ball dropping flat. Look at my handsome boys! 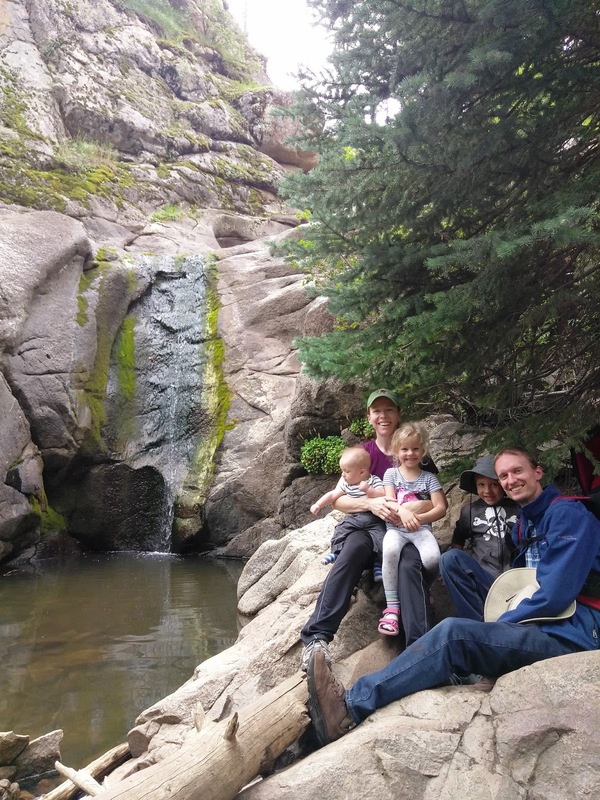 An awesome, and very successful family hike in the mountains. We had some family R&R in early September in Breckenridge. My fancy girl, just being herself. She is a little fashion diva! 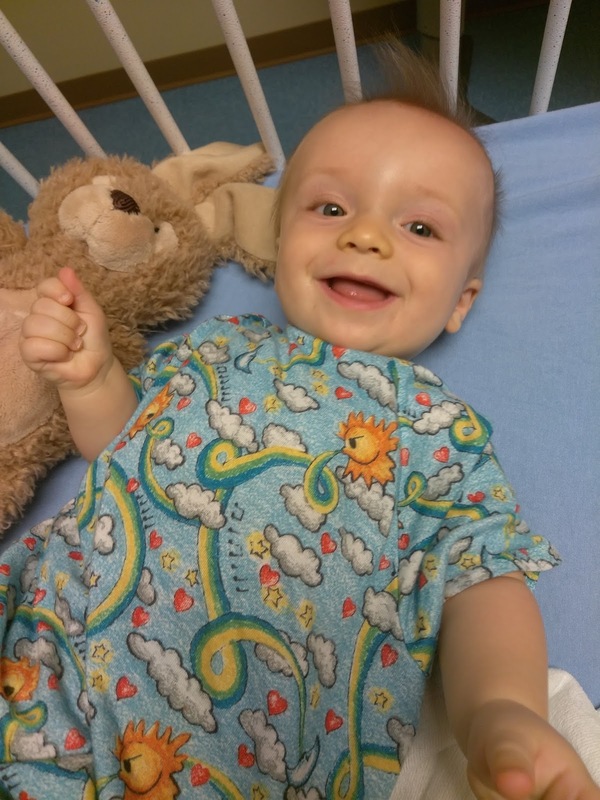 Jonathan went in for surgery in mid-September and charmed all the doctors! Goggles were a much hoped for birthday present. Ezra and Maren full of genuine sibling love. We love to do lunch outside in the shade of a maple tree. 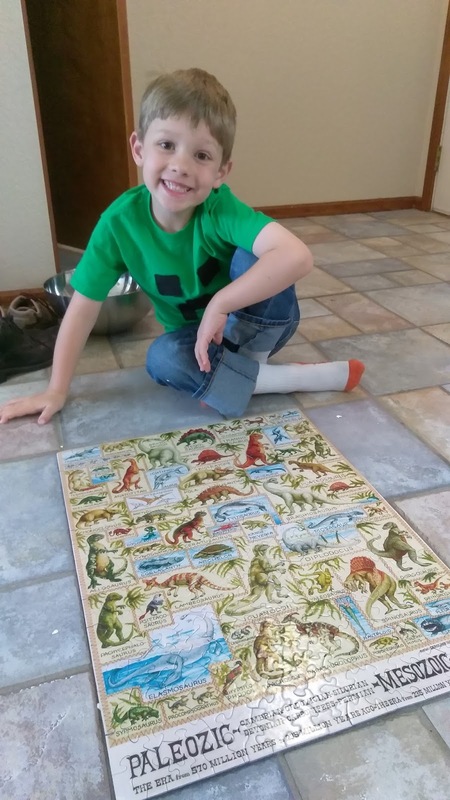 Ezra-Mommy time: put together a 300-piece dinosaur puzzle. 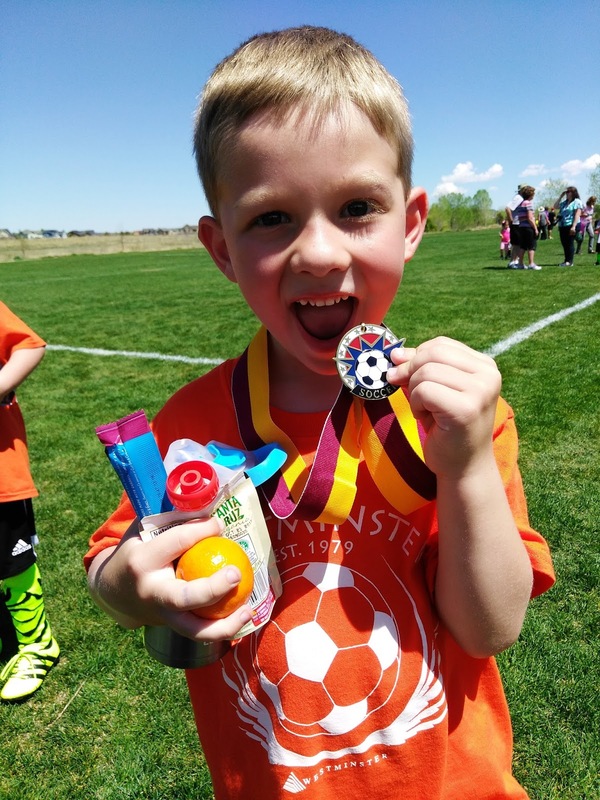 Ezra finished his first soccer season earlier this month. In the end, he was still one of the more timid, less-confident players, but I am so glad he had the experience. He learned to follow a coach's instruction, have fun with other boys his age, be responsible for his uniform and gear, and try something completely outside his comfort zone. We encouraged him to try and touch the ball at least a few times a game, and he tried. Soccer starts again in the fall; his coach invited him to come back in September and request to be on the same team. We will see how Ezra feels about playing another season. Ezra was super excited about earning a medal. The other big event of this month was preschool graduation. Graduation was Thursday, May 18, and it was actually snowing on that day--in fact it was near white-out conditions on the drive home. We were supposed to meet at a park and have a picnic lunch, but weather moved us to a local recreation center gym. Ezra absolutely adored his teachers, Ms. Danielle and Ms. Ashley, and developed friendships with most every member of his class. This was such a big year for him! I saw him grow up, increase confidence, continue to love learning, and wow his teachers again and again. Preschool was a very happy place for him. The early learning program was filled with engaging activities, lots of creativity, tons of projects, extra-curricular opportunities, and tons of support. I was so pleased with what I saw, and look forward to giving Maren and Jonathan the same preschool experience. 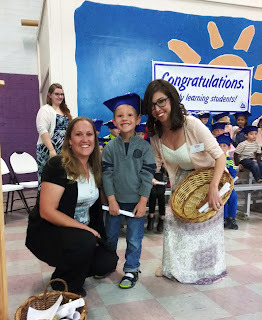 Ms. Danielle, Ezra, and Ms. Ashley on graduation day. 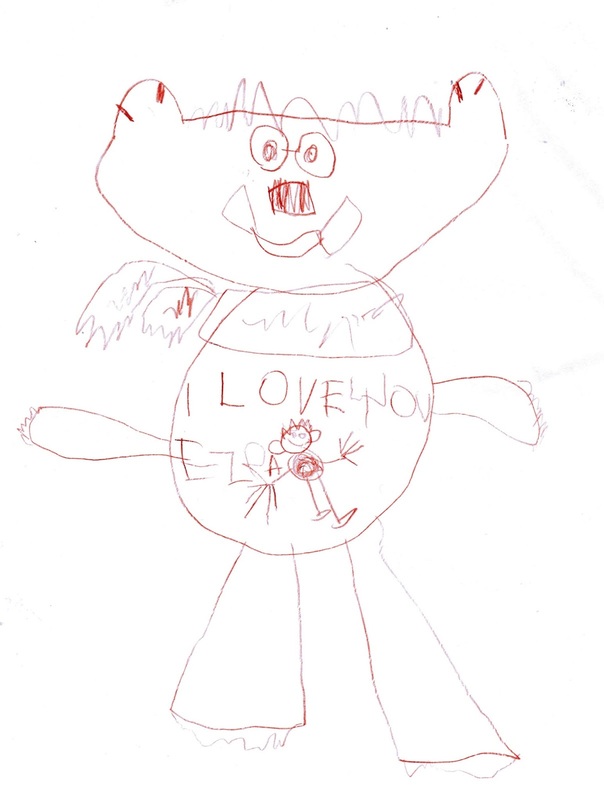 And, finally, when I was sifting through the stacks of Ezra drawings today, I found this gem. He sits down almost daily and creates. I certainly applaud his artistic interest, but I make no comment or requirement on his work; his art is purely motivated by what he wants to do. His creativity is impressive, his drawing ability is impressive, and his love for Bear is impressive. Bear wearing an "I love Ezra" t-shirt! "What activity do you like to do the most?" "What outfit do you like to wear?" "What is something you would like to try?" "A baker in a bakery shop." "Is there any place you would like to visit?" "Playing with my [toy] cupcakes in my bakery shop." Is she a girly-girl or what! I love that she is starting to establish her own unique preferences. She follows Ezra's lead most of the time in the how and what of their dramatic play. Only just recently has she become enamored with the idea of being a baker, something Ezra could care less about. She likes to line up various play food treats--chocolate chip cookies, scoops of ice cream, and cupcakes with colorful swirled icing tops--on display in our little indoor play house. "Who wants to buy some treats," she will call. "I have sweets at my shop, come see!" Also in the last month, her art is something other than indistinguishable scribbles. 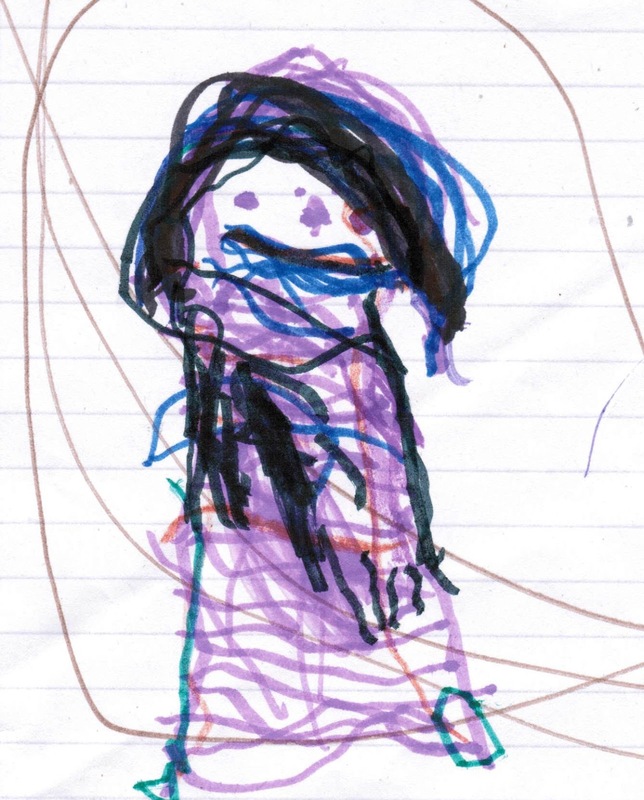 Ezra fills notebooks with his art, and until recently Maren only had the patience for one quick single-color scribble. I was surprised and so pleased when she did her very first self-portrait--wearing a fancy purple dress, of course. And, she has figured out the "alligator" pencil hold and can make very nice letters "m's (or up-down mountains, as she calls them). Maren loved visiting the library on Thursday afternoons when Ezra was in preschool for "Mommy-Maren time". Our public library has a lovely play area in the back of the children's section that has a rotation of themed play areas: vet clinic, fire station, Asian restaurant, doctor's office, and Maren's personal favorites, bakery shop and flower shop. 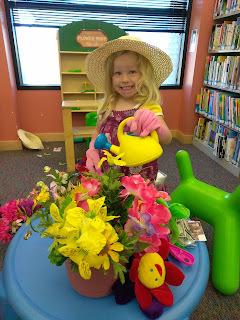 When I think of a truly content, at-ease Maren, I think of her on a quiet day in the library play area. Ezra far away, Jonathan asleep, surrounded by favorite play things, and Mommy all to herself. The week leading up to Mother's Day was one of my worst in a long time. I am not sure the reasons, I only know that everyone--most of all me--was thoroughly frustrated, battle-worn, and discontented, to put it nicely. By the Friday night prior to Mother's Day I was feeling like a complete and utter failure on every possible level. Saturday morning after some soul-searching, I proposed a temple trip. So, we pulled ourselves together, and all drove up. Dallin let me go into the temple first. I had a few of his family names ready for their initiatory ordinances. I had to wait a bit, but it gave me time to soak up some of the peace of the Lord's House. Somehow, in the miracle of temple service, I left feeling like a layer of worldly sludge had been lifted. There was no miraculous transformation, but a subtle lightening, and refreshing that gave me hope for future positive mothering. 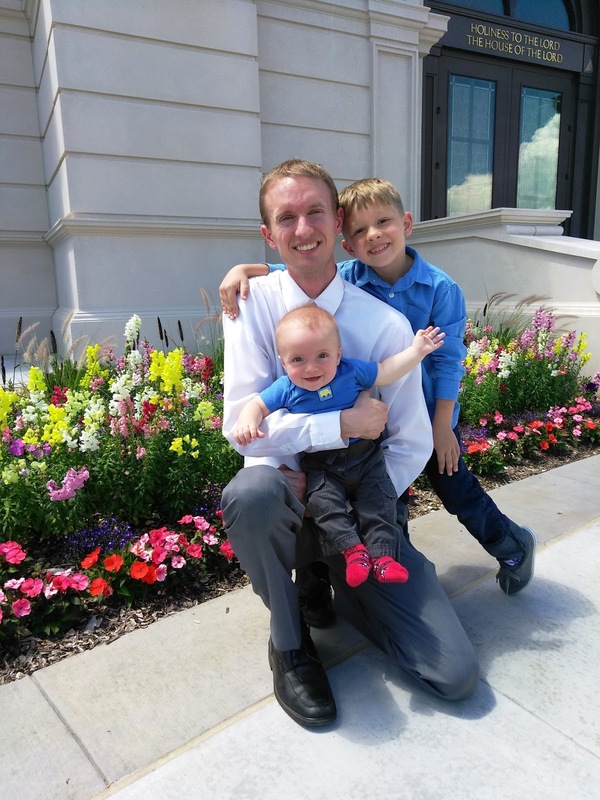 In fact, my heart was softened and humbled enough that I actually wanted to go to the Mother's Day sacrament meeting. Thankfully, the speakers were sensitive in their approach. I was struck by a particular comment a father of five made. He reminded the congregation of the relationship that Eve and Lucifer had in the Garden of Eden, namely one of enmity. And then remarked, that mothers often feel the brunt of Satan's attacks because he is so wholly engaged at thwarting their work. I took comfort in that comment. Nasty week = warfare with the adversary. He hopes for my failure, but the temple arms me with power to fight back. And I do feel better armed for having been in the temple. 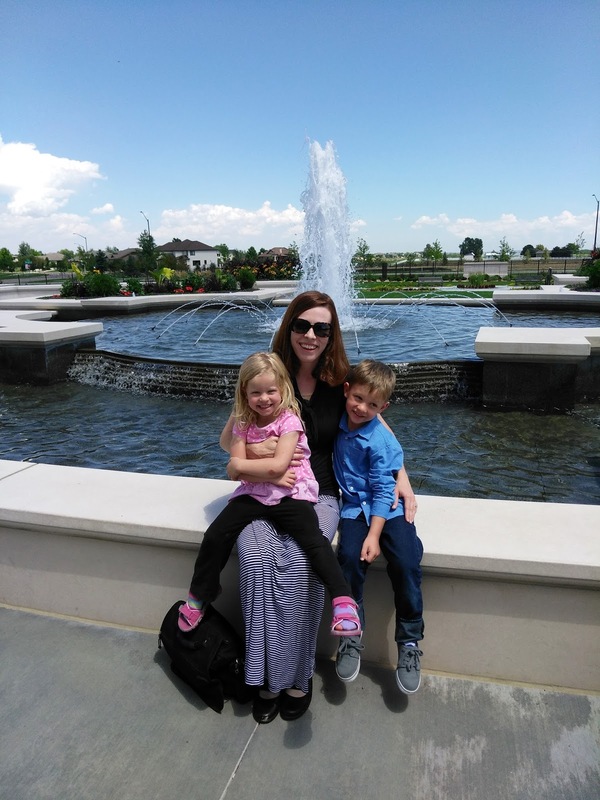 The temple saved my Mother's Day. Sunday afternoon we joined John and Roslyn for a Mother's Day dinner at their house. 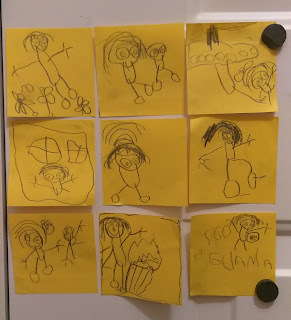 I requested a few family pictures to remember the day. I love this photo of 3-month old Ezra and Daddy, and thought it would be fun to re-visit the pose with nearly 3-month old Jonathan. I love all my handsome boys! Three children brought with it an unexpected consequence: Maren is now a middle child. Ezra is the somewhat bossy, often manipulative older brother. He has a big kid car seat, a fun preschool, a bigger bike, soccer, violin, and kindergarten on his horizon. He is also passionate about his hobbies, and has deliberate ways to use his free time. Jonathan is the need-everything-now, louder, mostly helpless baby who is novel, and darling. 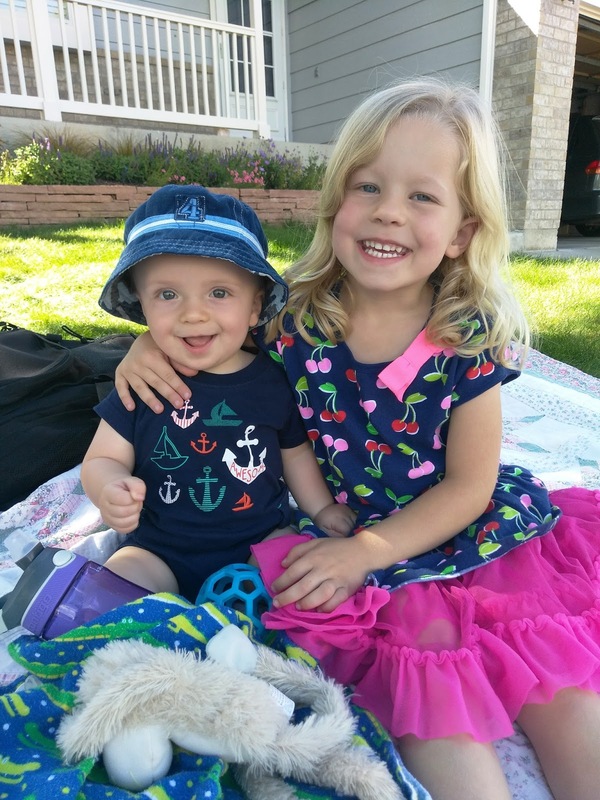 Maren is lovely, fun, spunky, and strong, but she doesn't have many extracurricular activities, hasn't yet found her passion, and mostly plays what Ezra plays, with some girly variations. I notice that on days when Ezra has preschool and she is at home with me, she is at a loss of what to do. Ezra tends to dominate, and loves to be her little mother. But, perhaps because she is a middle child or perhaps as a contrast to Ezra's personality, she is often more flexible, willing to compromise, independent, and level-headed. 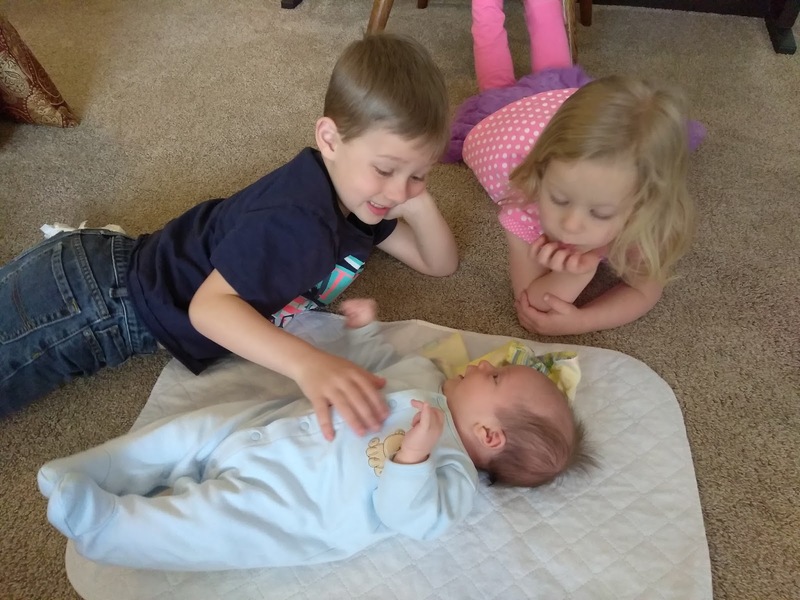 I wonder if, in time, she will develop more refined social competence in relating to both a younger and older sibling. Additionally, as Ezra tends to be more rules-focused, duty-bound, and responsible, Maren tends to be less concerned about those things, especially doing chores. 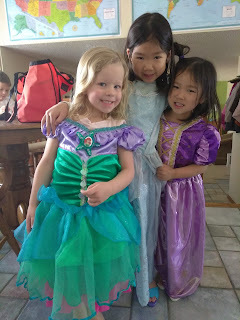 Maren loves when her girl friends come over, so she can bask in girl-focused play. Most of the time, Maren-and-Ezra play involves a diverse mix of Legos and princesses, dinosaurs, and dolls. 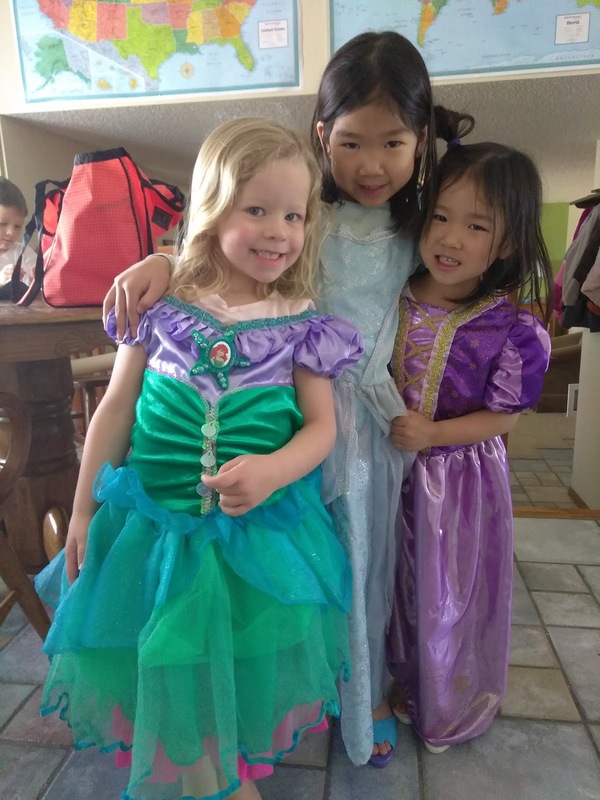 The princess dress collection that Grandma Roslyn so graciously bequeathed to Maren is the first and favorite activity when some of her cute friends, like Hannah and Naomi come to visit. I wonder if, in an effort to stand out from Ezra in a contrasting way, she has gravitated to girly attire to assert her uniqueness. She does love her poofy skirts and high heels! On those rare occasions when I can give Maren one-on-one time, she has little if any expectations about our time together, and tends to be very gracious. Recently, Maren and I needed to run an errand at a mall, and after I finished, I offered Maren a tiny cup of strawberry ice cream. 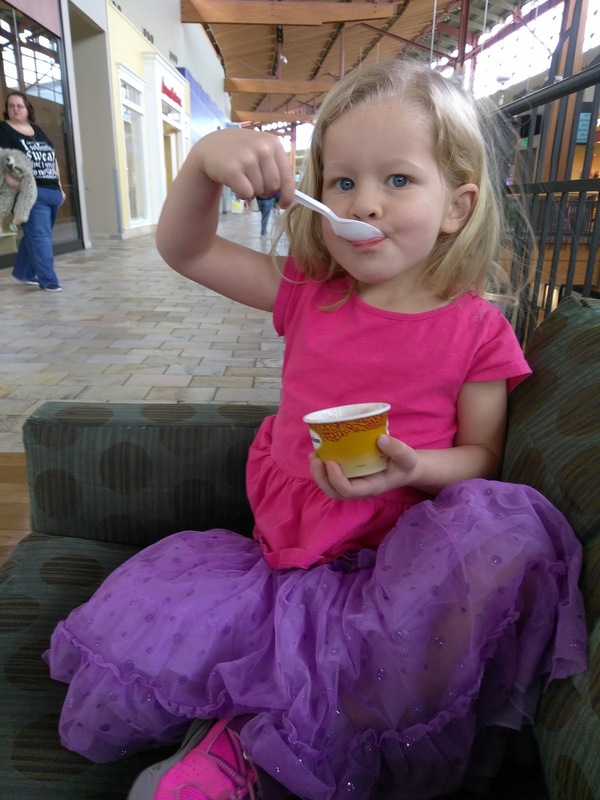 She was tickled that the treat was pink, tickled that the treat was ice cream, but tickled most of all that the treat was for her and no one else. Last weekend I gave her some Starburst flavored lip balms, just because, and you would have thought she had received a royal treasure. She carried her little lip balms with her with great pride everywhere she went. One of the favorite mommy-Maren activities is playing beauty salon. She loves to give me a sweet-smelling lotion massage and "fix" my hair. And she adores having her nails painted. It will be interesting to see how Maren grows and evolves this fall when Ezra is at kindergarten every day. Ezra is five years old and is experiencing and growing in a number of ways. He and daddy have been trying violin lessons for the past few months. He has a borrowed mini violin and bow in a tiny case. Lessons usually last 5 minutes or less and involve essentially the same few notes in the same little "Twinkle, Twinkle" tune. Ezra seems interested, but progress is slow. I took the opportunity to try the violin and there is a lot to think about! Chin position, hand position, bow position, fingers in the right place (press hard! ); I can see how it might be overwhelming and slow-going. Ezra tends to get discouraged easily, but I am hopeful that he will start to see his progress. I am impressed with his efforts! Ezra can ride a big boy bike--no training wheels! He started his bike experience as a toddler with the popular "balance bike", and has happily ridden it everywhere for the past two years. We were gifted a friend's old bike, which Ezra finally wanted to try out a few weeks before baby was born. He and I practiced on several occasions, but he seemed defeated by fear of falling. A few days after baby was born Ezra and daddy went out to give it another try. And, to my surprise, he got it in just about an hour of practice! Amazingly, he made the leap from balance bike to big bike without a single fall. Here is a little video of the day he learned. I am so proud of him! 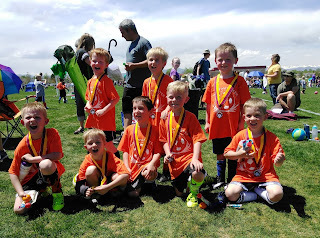 Ezra is also trying spring soccer, and is on the learning curve there too. Poor kid, he is so sports clueless. Apparently we have not given Ezra much of a sports education. Mom: "Ezra, I signed you up for soccer. You will be on your friend Teagan's team." Ezra: "Ok, mom. Do I need a helmet?" Mom: "No, you wear a helmet to play football." Ezra: "Will I use one of those club things to hit the ball?" Mom: "No, that is for baseball." 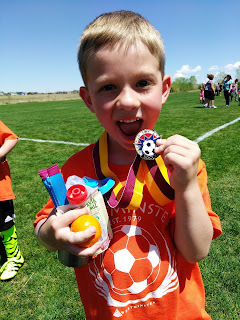 Ezra is trying to be a good sport with soccer, but it is obvious that even at five years old, many of his teammates have already played a year or two. He is sort of obsessed with winning, and was pretty depressed when his team lost their first game. But, he seemed to enjoy the physical activity, the comradery with other boys, and the idea of being a great soccer player. He has an hour practice every Thursday night, and a game every Saturday afternoon for the next eight weeks. Hopefully with practice it will be a positive first experience. 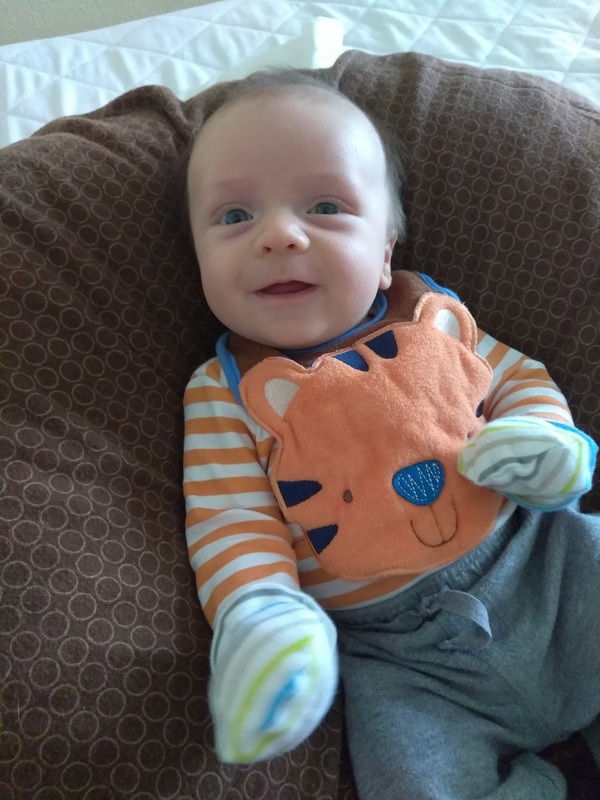 Jonathan is a little more than six weeks old, and has started to smile at every happy face who comes into his view. 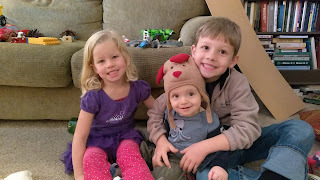 Ezra and Maren are adjusting, and for the most part, handling the change with grace. 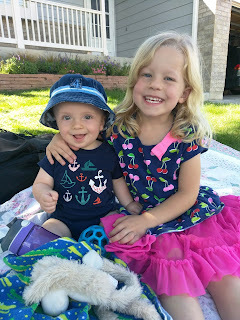 Aside from preschool, soccer, and some very quick shopping trips, or short library visits, we stay close to home, and keep things very simple. And, though we have had some rough days, for the most part, we maintain our delicate balance. In a nutshell, that is our life right now. Jonathan smiled for the first time at one month, and it seemed to be a great healing balm for some of the older sibling angst/jealousy. 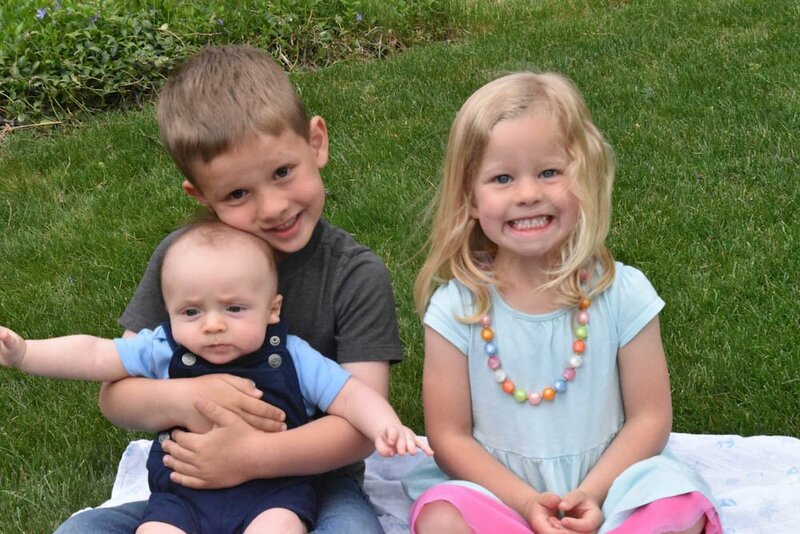 Baby has a great defensive strategy: smile! He is incredibly charming when armed with a huge grin. 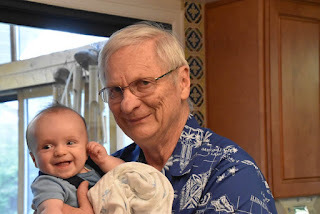 Jonathan smiles especially keenly for Ezra, which, of course, is incredibly gratifying for big brother. Maren is less engaged with the baby, and seems mostly disinterested, but she warms up when he breaks into a smile too. Last week, two neighbor boys rode their bikes over when Ezra and Maren were playing in the front yard. 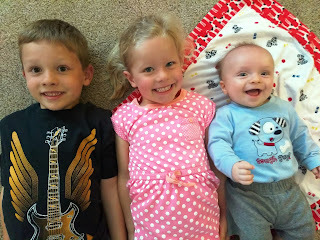 I was pleased to hear my kids immediately share this news with the boys: "We have a new baby. He is really cute. Do you want to see him?" The older boy, about 5, was interested. They all paraded into the kitchen where he was dozing in a baby chair. "Oh, he is so cute!," the boy exclaimed, "Can I pet him really gentle?" Ezra and Maren proudly stood by. "He is our baby, but you can touch him." It is quite a marvel to see Jonathan changing from newborn so quickly. At about one month, he turned a corner, and seemed to take a small, though significant step forward in his development. In addition to smiling, he started turning his head to follow people and sounds, and began to differentiate his crying. When he needs to complain, he will hang out a big pout lip, and whimper like a sad puppy, as if to say, "Oh mom, I'm so lonely, hold me please!" I have figured out his tired cry, and know when it is time to find his softest blanket, swaddle him up with his pacifier, and rock. He has also started to experiment with his voice, and makes funny high-pitched squeals and squeaks as he attempts to communicate with us. And, not surprisingly, Jonathan is incredibly observant; a wide-eyed on-looker, soaking up all the sensory inputs of his world. Consequently, he often fights sleep, gets overstimulated and overtired, and needs a warm bath (he loves the bath! ), a lotion massage, and a good blanket swaddle to settle. Three kids is indeed a challenge, and a lot gets left undone, but what a blessing to have another little sweetheart in our family! Jonathan surprised us all by being born on his due date. In fact, I was convinced that of all the days he wouldn't come, he surely wouldn't come on February 8th. After all, that was the day that John and Roslyn were getting on a plane and leaving town (in the morning), and my mom and sister were arriving at the airport (in the late afternoon). 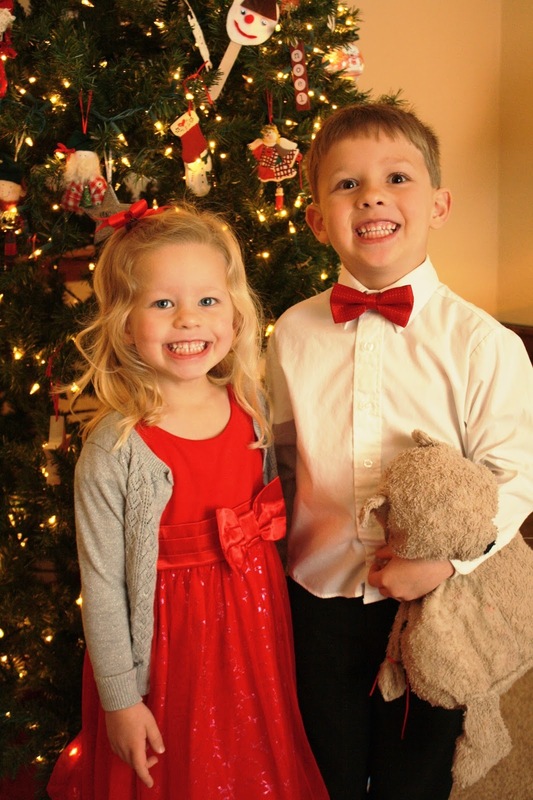 There was a good chunk of time when no grandparents would be available to help with Ezra and Maren. Any other day was less busy, so surely he would come on some other day, right? The morning of 8 February started with a little surprise. I found a quantity of bodily fluids in the toilet after my first trip to the bathroom. Did my water break? I called my mid-wife and she suggested that I do some squats or take a walk to determine if my water had broken or if I was noticing a "bloody show", which simply signaled that labor could happen sometime in the future. If my water had indeed broken, I needed to come into the hospital that morning, as soon as possible (as I tested positive for GBS). If it was just the "bloody show", there was no urgency, and no need to come in. Any movement on a broken water bag would cause more leaking; I was advised to watch for more leaking fluid. Around 9 am I took a walk. The morning was warmish, but very windy. I went walking for about 25 minutes, and during that brisk walk, I started to get intense abdominal cramping. I thought that it was likely some very intense Braxton-Hicks contractions because it was only in front. But, they were so intense I had to pause and breathe through them. I remember thinking how odd that was, since, of course, I couldn't be in labor. I probably had seven or eight contractions during my walk, but they only lasted 10 seconds, so I didn't think much of them. My walk clearly showed that my water had not broken, as I had no more leaking fluid. My mid-wife called during my walk, and I gave her the news. The urgency in the situation was gone. "You will probably go into labor sometime this week," she guessed. "We will probably see you sometime soon. Keep us posted," she said. Dallin was at home with Ezra and Maren, waiting to know the news from my walk too. When I got home, I told Dallin he could probably go to work since my water had not broken. Sometime before 10 am, he drove to work. I took a shower, thinking the warm water might calm down the Braxton-Hicks cramping; I was probably just walking too fast I thought. But, the cramping did not go away, even with a warm shower, and around 10:30 they stepped up in intensity. At that point, I realized that I was in fact having contractions, and I started timing them. They were intense, but sporadic, so I figured I had plenty of time before I might need to call Dallin home again. The contractions lasted sometimes 10-15 seconds, sometimes 45 seconds; sometimes the contractions were 20 minutes apart, sometimes 5 minutes apart. While I was still able, I packed my hospital bag. By 11:15, I started to realize that this was indeed true labor, and things were progressing very rapidly. My contractions had intensified again, and they were starting to come every 5 minutes, lasting for a full minute. I called Dallin around 11:30 and told him to come home fast, it was time to get to the hospital. As best as I was able, in between contractions, I also messaged my neigbor/friend/visiting teacher Jenn, and asked if we could drop off our kids around 12:30 when Dallin got home. Thankfully, mercifully, and miraculously, she was home and available. Her house is just five minutes from our house, and as it turned out, 5 minutes was all the more time we could spare. I turned on a little show for the kids so I could have space and quiet time to process the contractions before Dallin got home. When he came in the door around 12:20, I could hardly walk or talk. We dropped off the kids at 12:30, and raced to the hospital. Sometime in the 25-minute drive to the hospital, the contractions kicked up another notch, and they started coming at 2-minute intervals. Dallin had a white knuckle drive over, and I started to wonder if we would make it in time. As we pulled up to the curb at the hospital (around 12:55 pm), a nurse was wheeling a discharged patient to her car, he came over directly after unloading her and picked me up in his wheelchair. I needed it! I could barely take three steps before a new contraction started. I was wheeled up to a triage room and asked to dress into a hospital gown. After I was changed, the triage nurse checked my cervix. I was dilated to a very healthy seven, and in transition with contractions every 90 seconds, a few seconds of break, and then right into another one. Quickly, I was wheeled to a delivery room. And a mad scramble ensued: Call the midwife, bring in a baby warmer, set up her IV, attach the fetal monitor, etc. The midwife walked in joking, "Just bloody show, huh? This baby likes to be dramatic. Let's meet this little guy!" With seven or eight more contractions, and ten pushes, Jonathan made his fast, unexpected, beautiful arrival. 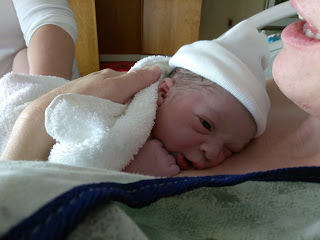 He was born at 1:17 pm. Dallin cut the cord, and he was placed on my chest. 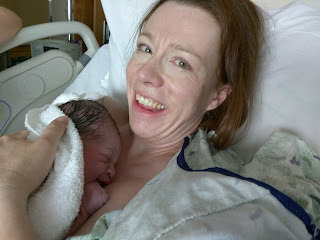 And, then, the four-hour wild ride slowed down, and I enjoyed that precious first snuggle time with my little baby boy . There is nothing so sweet in all the world! He is healthy, he is beautiful, he has arrived! I am so grateful we had him in the hospital! Here is a (highly unflattering) picture for the sake of history. I am in my 9th month, about 10 days from my due date, and feeling about as tired as I look. No other complaints aside from that, just so, so tired. Every time I sit down to read children's books to my children, I fall asleep, usually half-way through the second book. Honestly, practically every time I sit down anywhere slightly soft and comfortable I fall asleep. I need a little nap every day, and for the most part, the kids are awesome at giving me an hour and entertaining themselves in safe, peaceful ways. I am so grateful! I do not really have strong pregnancy food cravings, but I have had a fresh pineapple addiction lately. Over the Christmas holiday pineapples went on sale two or three weeks in a row for just .88 cents a piece. We often had three or four lined up on the counter at various stages of ripeness. I can and did often eat an entire pineapple myself in one day. Grapefruit and oranges have tasted amazing too, as of late. 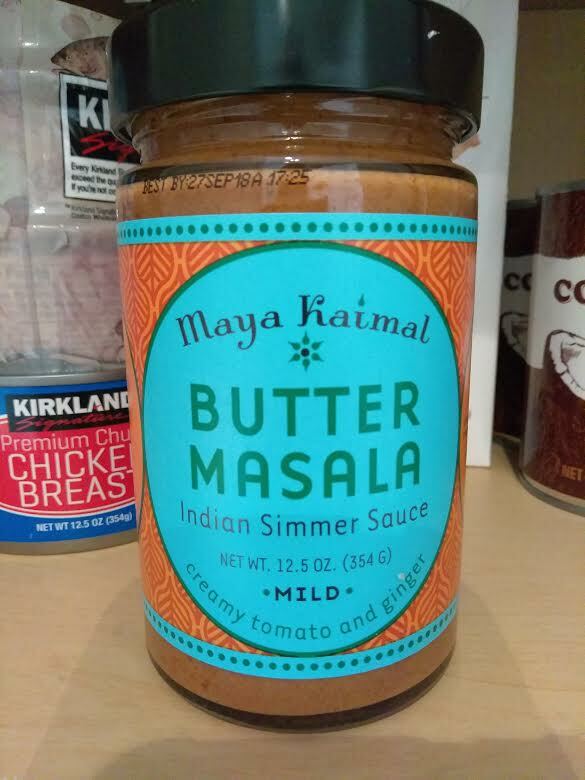 Butter masala simmer sauce with roasted cauliflower over rice is a new favorite too; all the warm, rich spices taste like candy to me. 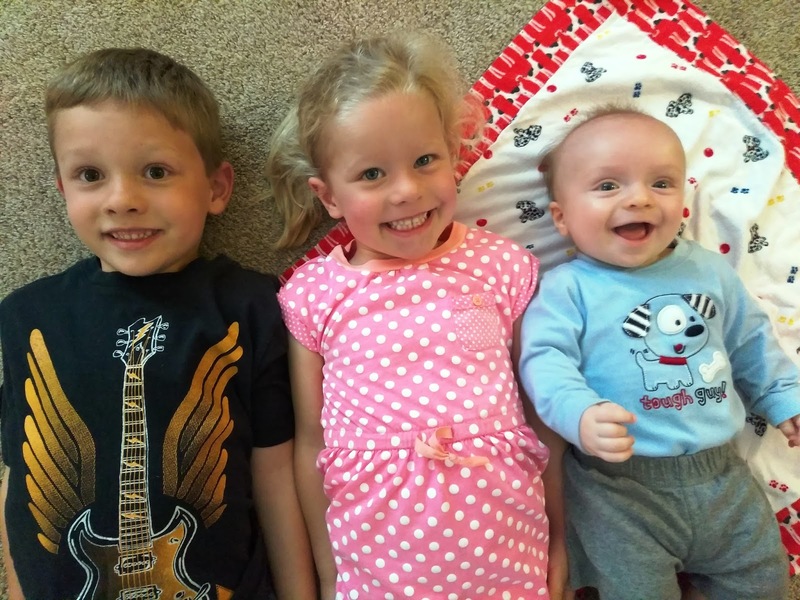 Ezra and Maren took a sibling preparation class at the hospital earlier in the month. They often accompany me to doctor appointments and have heard the baby's heartbeat half a dozen times. We read books about baby coming, and they like to feel my belly when baby has hiccups. Anticipation is high for everyone, but as with the other two kids, my body hasn't decided to do anything yet, not even any Braxton Hicks contractions. So, we are waiting. Almost there, but not quite. This year in Primary the 2017 theme is simply, "Choose the Right." The introductory song for the theme, the one that all Primary's in the church focus on in January is, "As a Child of God." I came to earth with power to choose. Good choices bless me and my family too. The Holy Ghost helps me to know what is right. I can't tell you how many times those beautiful, simple words have come up in family discussions this month. Agency is one of my favorite gospel principles; it rings so true to me that we have the opportunity and responsibility to act for ourselves, and that all choices have consequences. 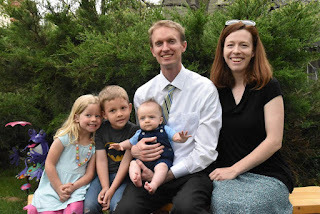 Last week Ezra, Maren, and I were leaving a friend's house, and right before we backed out of their driveway to head home, Ezra lashed out at his sister, and lost a privilege because of his poor choice. As we drove home, Ezra was feeling remorse for the lost privilege, and lamented, "Mom, I just can't change. Changing is too hard. I can't do it. I just keep making bad choices." I wanted to jump for joy! What a profound truth with a perfectly wonderful solution! With the companionship of the Holy Ghost, I confidently declared my testimony of the sweet reality of change. I sang those opening lines to Ezra, "I came to earth with power to choose..." I shared with him the blessing of agency, a gift from Heavenly Father, and the redeeming power of the Atonement that allows for individual choice, and gives us opportunity to make amends and try again. I encouraged him to include his righteous desires to change in his prayers. A few days later at dinner, he said an unusually introspective prayer, as he prayed for help to love Maren, to be calm when things made him mad, and use his agency for good choices. I was touched by his little boy humility. Truly, the Holy Ghost does help us all to know what is right. I'm so grateful. Maren's new favorite article of clothing is the above dress, which she calls her "naked dress"; she likes it because it has "strap-es". She wants to wear this or her swimsuit every day. No pants, no shirts with sleeves, occasionally certain tights, and a shear poofy skirt, and nothing else. When we have to go to preschool, she grudgingly changes to meet protocol for a winter climate. As soon as we are home, she changes back to her naked dress again! (I am not really excited about her clothing choice, but she is an emotional wreck if the dress is in the wash, so I don't fight her on it). 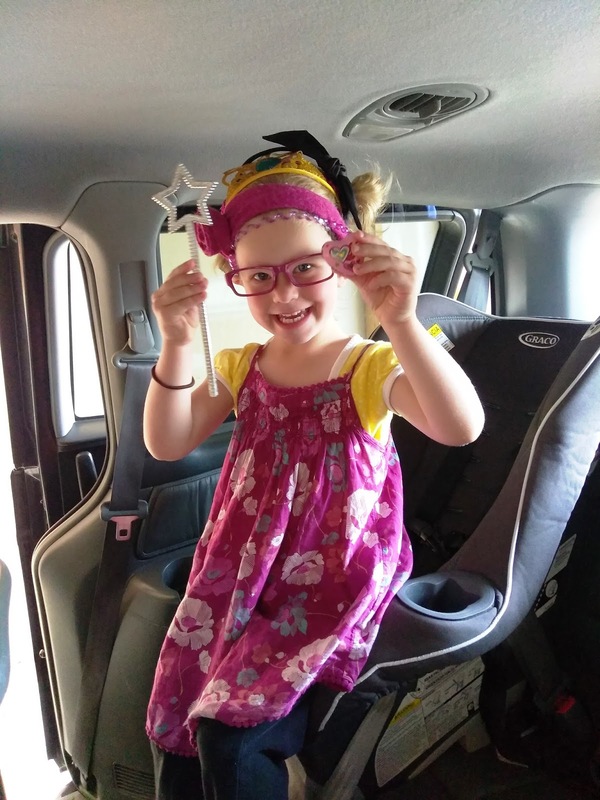 Recently, we were headed out to church, and she refused to wear a sweater or jacket of any type with her short sleeved dress. It was cool, but not frigid. "Mommy, I don't need it. I just want to feel the sweet breeze." 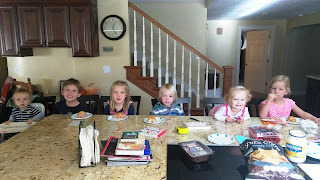 Earlier this week we were at a friend's house, and the little girl pictured above came up from the basement in tears. As soon as Maren recognized the crying as that of her friend Naomi, she ran down the stairs. The two of them came upstairs soon thereafter. Maren had one arm wrapped around Naomi, and the other arm patting her chest. She carefully guided her friend to her mom, and then ran over to me. Excitedly she announced, "Mommy, I'm practicing being a good big sister! I'm a good big sister to Naomi!" 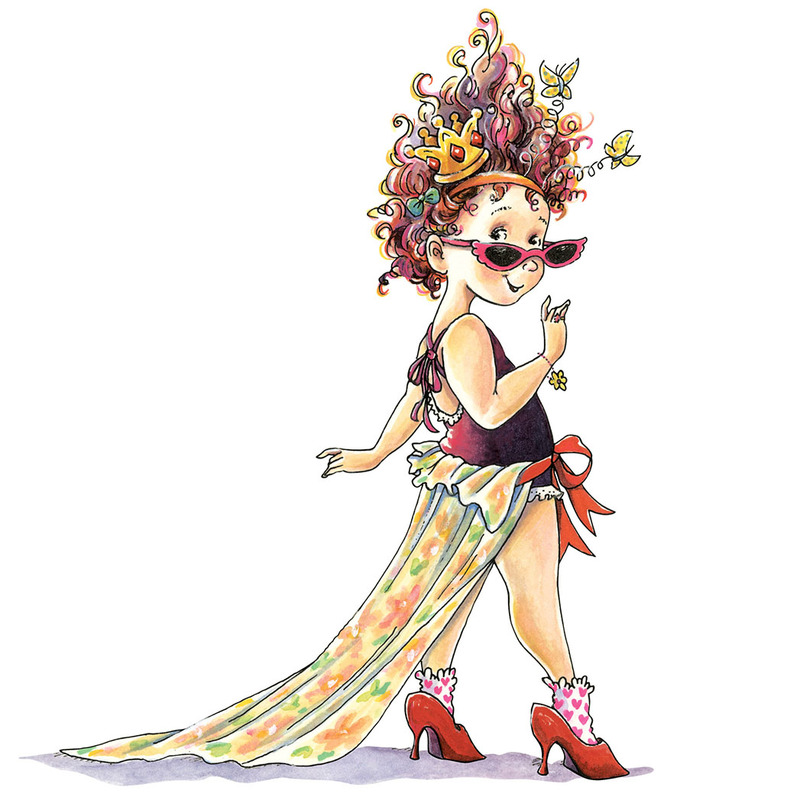 Maren adores the Fancy Nancy book series. She wants to be fancy all the time, and will sometimes come to me crying if she can't find enough "fancy" things to add to her outfit: her princess shoes, a headband, a scarf, hair clips, etc. I believe I have this endearing, fictitious children's book character to explain my child's fascination with immodest, weather-inappropriate clothing! As of last Sunday, Maren is a Sunbeam at church. She transitioned beautifully. Truly, it was a remarkable thing to behold. No tears, no hand-holding, no qualms, no fears, just a confident, self-assured presence, and excitement for a new step. Maren is giggly, fun-loving, and silly. She likes to wear my glittery lip balm, and smelly-sweet lotions. She is super girly, and loves everything pink, but is also perfectly content to play cars and dinosaurs with Ezra. 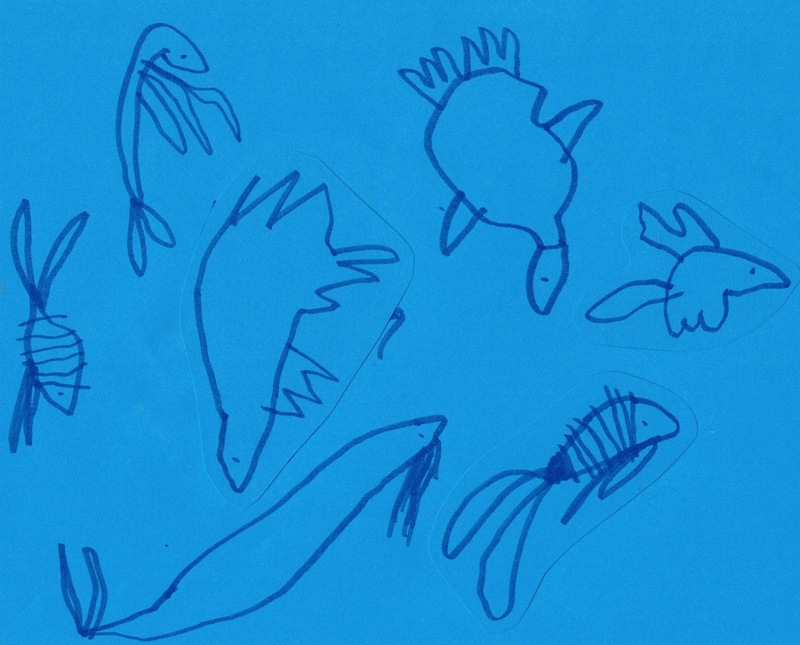 Ezra created the above about a month or so ago; a darling sampling (some cut and pasted to be all on one page) of my Ezra-boy's obsession with marine biology. 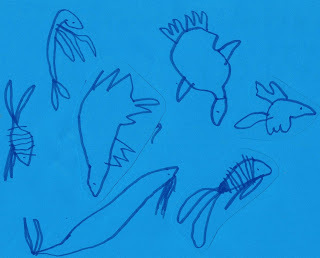 I have to say, I am very impressed with his accurate, though stylized representations of some favorite water creatures. My drawings sometimes feel forced; his are so natural and free. I love it! Earlier in the week I subdivided a large sheet of white paper into various geometric blocks and Ezra and I made simple Zentangle drawings together. There was only one rule, every block needs a different type of pattern; he really got into it! Yesterday, Ezra, Maren and I did watercolor paintings, and both kids sat and painted for more than an hour. About a dozen pieces of paper later, they finally had their fill. Last night we watched a NOVA documentary about the mysteries of math in the universe, and Ezra was truly entranced. At the end he said it was better than expected, and really interesting. He has the patience for building with little Legos, but also the patience to play dress-up, and kitchen with his sister. He likes puzzles and brain teasers, and has been particularly enamored with an Aunt Molly Christmas gift, a game called Camelot Jr. that requires basic spatial logic skills. He just recently has discovered the joy of new friendship with several boys in his preschool class. After school on Tuesday he reported that Joshua and Patrick thought his jokes and silly stories were funny. "I think I make friends easily Mom. My friends like my jokes." Ezra has made huge strides in social development in the last year, which is extremely gratifying to see. He has friends now; last year at this time he was scared/intimidated by of most of his peers. Christmas is often filled with emotion, anxious anticipation, and joy. This year my Christmas has also included more feelings of gratitude for the gift of life and health. One of my good friends, someone I see regularly, usually weekly, lost her mother suddenly earlier this month. She is still reeling that her mother, just 66-years old, is really gone. 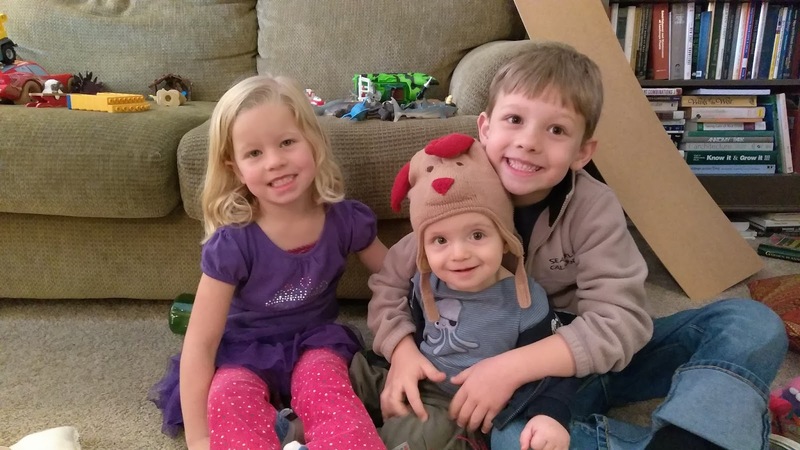 A nine-year old boy in our ward with a rare genetic disease that causes slowed growth, digestive, heart, and respiratory problems had open heart surgery a week before Christmas. His recovery has been slow. Another friend in the ward, an older lady that I love, and have served with in Relief Society, had quadruple bypass surgery two days after Christmas, and is struggling to heal. 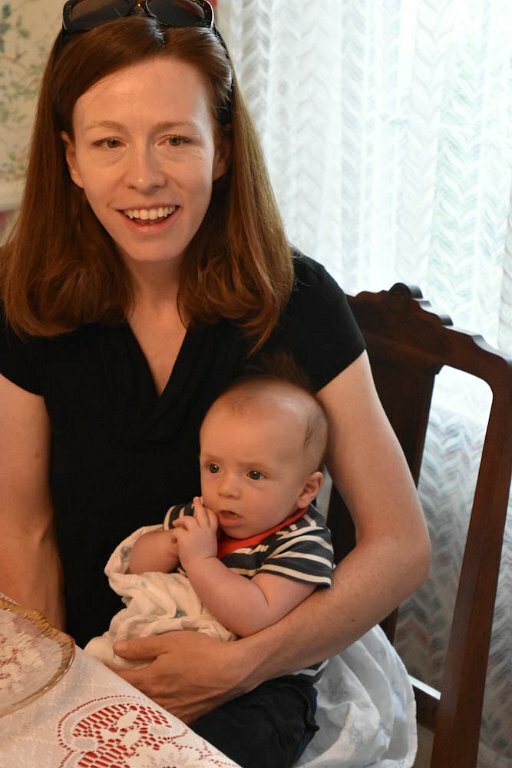 Another friend was anticipating the birth of her third son on January 5, but instead this seemingly perfectly healthy baby passed away in the womb on December 23. Life is so fragile and unpredictable! Sometimes there are unanswered questions. Sometimes life feels very unfair. But, I rejoice that in the midst of grief, loss, anxiety, and fear, there is the Light of the World. I feel such gratitude for the miraculous birth of Jesus Christ that brought a new star, and hope everlasting. In the sorrows of life, even at Christmas time, there is a Prince of Peace. Although my experience is only second-hand, I feel grateful for my association with each of these people. The gospel plan, the Father's will, and principles of faith, hope, and charity are made more alive in difficult times. The combination of the Christmas season, and friends who are hurting have made my own covenants more meaningful. I have found joy in offering needed service, praying more earnestly for specific people with specific needs, and have found myself thinking of others more. I am grateful for healthy children, a loyal companion, and the support of family. I am grateful for the tiny life inside me, and a pregnancy without complications. I am grateful to be a mother. I am grateful for gospel perspective. I am grateful for opportunities to feel something of what Christ has felt. Yesterday, the high was 81 degrees, the low was 40. We played outside for a good two hours, and had a picnic lunch in our shorts. It was absolutely marvelous, though rather odd. As of yesterday, we had had ZERO precipitation of any kind in October AND November. The lack of moisture and string of perfect 70 degree days in the late fall has been glorious, though, certainly a little disconcerting. We have been counting our blessings, and enjoying an unseasonably temperate autumn. There has been much scooter and bike riding, park days, walks, hikes, and outside time that has all but made up for our rather bland summer (on account of my nausea). Today, the high was 40 degrees and the low was 26 degrees. The snow started at noon, and lasted all day. There were sometimes 20-30 mph wind gusts that left us breathless. A light snow cover now coats our flowers that were still blooming perfectly yesterday. Moisture of any kind is most welcome! I am grateful for the snow! But, again, for the record, yesterday we had a picnic in the front yard in shorts. 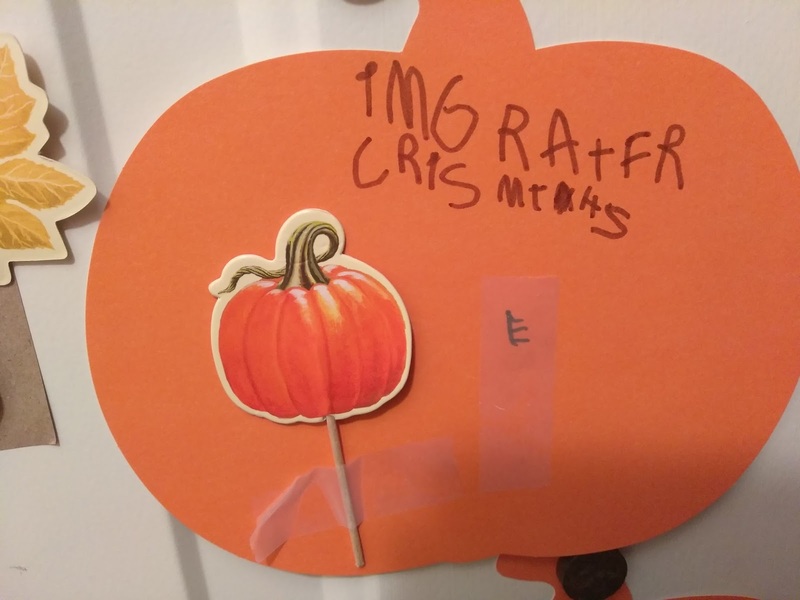 "Im gratfr famle." (translation: I'm grateful for family." "I'm grateful for my heart blanket." "I'm grateful for the color pink and purple." "I'm grateful for my mom and my dad." "I'm grateful for Mary (mother of Jesus)." "I'm grateful for a good neighborhood." 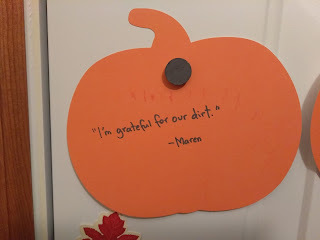 "I'm grateful for our dirt." This is us, counting our blessings. It was a lovely way to spend an evening!